If you’ve been playing around with Snapchat and starting to use it for your business, you should check out Snapchat Ads. Ads on social networks are extremely effective, and Snapchat is no different. But there is something very unique about the platform. The potential of this platform lies in the fact that deletes every piece of content you send out after 10 seconds. What Opportunities Does Snapchat Offer to Business? First of all, Snapchat it’s very different from every other social network available out there. This tool offers a communication that is fast and private, making this moment an exclusive interaction between brand and audience. This is an added value since this encourages people to be more active and share more content, with the unique result every brand chases in social media: creating relations between brand-customer. Snapchat allows you to draw all over your photos, add filters, and write texts on the pictures…basically, allows you to explore your creativity. This is much more than just an instant messaging service, here you can use your creativity and humor, making the experience much more fun than just having a conversation. Building relationships with your customers. Yes! 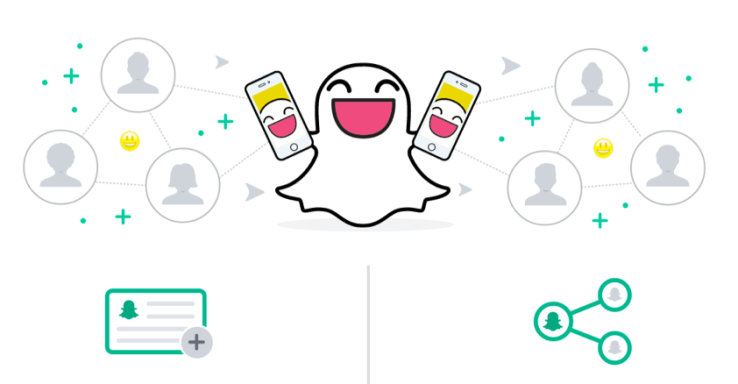 Thanks to the exclusive and private way Snapchat works, you can make your conversations personalized, offering exclusive information about contests, new products, and private information to followers, etc. For example, HBO created a special ad promoting the upcoming new season of their series Girls, making this a very exclusive information only for their followers in Snapchat, which turned out to be an amazing secret to share with everybody, right? Why Using Snapchat To Advertise? Despite being relatively new, Snapchat now has more users in the US than Pinterest or LinkedIn. You probably thought that Facebook and Twitter were the most important social networks out there, but Snapchat has already outnumbered the Twitter. Snapchat Ads are videos that can be up to 10 seconds. If the customers want to see more or go to the website of the brand, he can swipe up and go directly. This video will appear in between the rest of the stories of the user. This new function will allow you to see the performance of your campaign. The first step is to set up a business account. Go to https://forbusiness.snapchat.com/gettingstarted/ and click Get Started. The Ad Manager offers you four main views: Dashboard– to start a campaign or see the analytics of existing ads. Creative Library– to see or add drafts. Custom audience– here you can create a custom audience to reach specific customers based on your data. Help center– you’ll find here more option about Snapchat Ads. Select an objective: you need to take is select an objective for your campaign. It can be driving more traffic to your website, grow awareness, or drive video views- select the one that fits you best. 1. Schedule: Next step is to select your schedule, from date to date, or indefinitely. You can also set the status (active or paused). 2. Set the audience: you need to select the country where your campaign will be based on, you can also specify by demographics (the type of people you want to reach), audiences (target people based on what they like), etc. 3. Budget and goals: in this section, you need to specify your daily budget, goal, and bid amount. For now, it looks like the daily budget is $100, any lower than that and you won’t be able to move forward. 4. Create or upload your ad: For this, you just need to click + New Creative. You’ll have to choose your ad type and create your ad. 5. Select and ad type: you have four types available at the moment- Top Snap, Web View, App Install and Long-form video. The first one is a video up to 10 seconds long. The second one is a call to action to go a purchase the product on your website, which will allow you to drive traffic to your website. App Install is to drive people to your app in App Store of Google Play Store; finally, Long-form video is like a trailer for your long video that can be up to 10 minutes. 6. Launch campaign: Now your campaign is ready to be launched. After you have launched your campaign, you can monitor and report your performance in the dashboard of the Snapchat Add Manager. And that’s all you need to know to get started with Snap Ads. Please tell us what worked for you, or if there is something we missed in this post, let us know!